Developed in 2009, Woozworld ® Inc created and operates Woozworld.com, a Web 2.0 innovative virtual social network, specifically designed to answer the needs and expectations of tweens (8 to 14 years). Possessing solid and recognized expertise and having the advantage of sustained growth, Woozworld Inc. received Series A financing in the amount of $3M in May 2010 from iNovia and ID Capital, a division of Groupe Telesystem. Woozworld Inc. is the child of a recent spin-off of Tribal Nova Inc., a development studio based in Montreal known as a leader in virtual world development and online gaming services for youth. The growth of the Woozworld community has been phenomenal. 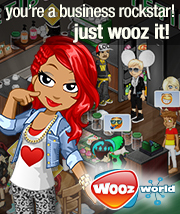 In 2010, less than one year after its official launch, the company announced that the Woozworld environment consisted of 2.4 million avatars in more than 80 countries and more than two million Unitz (virtual spaces) created by the users. More than 25 million profiles (avatars) created (June 2014). More than 29 million Unitz (virtual spaces) created (June 2014). 375 million virtual goods in circulation (June 2014). Based in Montreal, the company has assembled a high-caliber team with exceptional expertise in marketing, business intelligence, and the production and operating of casual games, principally in the multiplayer gaming arena and virtual worlds. 2015 Woozworld ® Inc. All rights reserved.